We are Rover people. We have asnorkel system for your 2005 - 2009LR3. This kit relocates your enginesair intake point from the relatively low and vulnerable position under the hood to a much higher and safer location where a constant source of cool, clean, dryair is available. 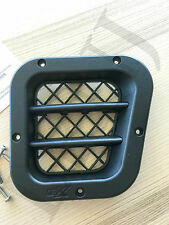 We have a New HiForce Wing Top Air Intakes SET ( 2 pcs ) -Satin Black fits Defender 90, 110, 130. We are Rover people. "OES Genuine Throttle Body --. OES GENUINE THROTTLE BODY. Condition : New. Therefore all implied warranties that may apply to your part are limited to the duration of this written warranty. Each warranty gives you specific rights, and you may have other rights which vary from state to state. "OES Genuine MAP Sensor --. OES GENUINE MAP SENSOR. Condition : New. Therefore all implied warranties that may apply to your part are limited to the duration of this written warranty. Each warranty gives you specific rights, and you may have other rights which vary from state to state. Part Number: SS395R. 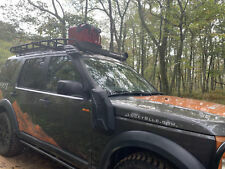 Huge air flow is but one aspect of the ultimate in snorkel Land Rover Discovery 2 design. The Safari snorkel air ram is designed to perform two very important roles. The most obvious is to funnel cool clean air into the snorkel body - but just as importantly, the Safari air ram acts as a highly efficient water separator to remove rain water from the incoming air stream - thus ensuring safe engine operation through even the most torrential tropical storms. We have a New Air Intake Grill Right RH -Passenger Side fits Defender 90 / 110 /130. Kit Includes NTC9127 - x2 ANR1148 - x4 ANR1220 - x4. We are Rover people. Need help?. Let's chat. Rims and Wheels. 2003-2005 RANGE ROVER - LAND ROVER 4.4L V8 ENGINE. Include ALL (BLUE) accessories UNIVERSAL (BLUE) high performance washable Air Filter. Fit the models below. "Beck Arnley Throttle Body --. Condition : New. Therefore all implied warranties that may apply to your part are limited to the duration of this written warranty. Each warranty gives you specific rights, and you may have other rights which vary from state to state. Snorkels are for more than just deep water crossings where they ensure water does not make its way through your airbox and into your engine while crossing rivers and unexpected flood ways. We have a snorkel that fits Discovery 2 2000 - 2004. 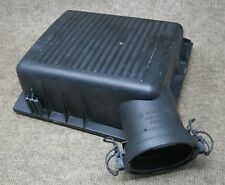 1994-1999 Land Rover Discovery Series I Air Box Complete. LAND ROVER LAND ROVER [AIR_CLEANER/BOX] (Discovery, 4.6L) 03 04 For sale is an air cleaner filter housing ONLY. LAND ROVER 2003 -2004 (Discovery, 4.6L). Model:LAND ROVER 2003. The warranty period starts when you take possession of the part. Applicable Models: DEFENDER 90 / 110 /130. AIR INTAKE TOP WING STEEL LH / DRIVER SIDE. and that is considered to be their full responsibility (with no exclusions). we may ask for photographic evidence or write off the goods. Mantec snorkel kit made from matt black Flexi Lite fits Defender 1987-2012. We are Rover people. 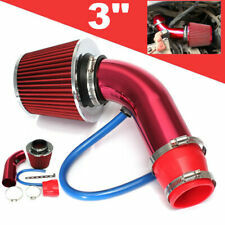 "OES Genuine Air Intake Hose --. 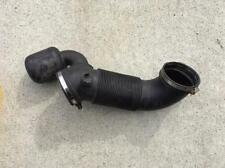 OES GENUINE AIR INTAKE HOSE. Condition : New. Therefore all implied warranties that may apply to your part are limited to the duration of this written warranty. Each warranty gives you specific rights, and you may have other rights which vary from state to state. LAND ROVER DEFENDER 90 / 110 KBX MULTI LAMP MOUNT SET. LAND ROVER DEFENDER 90 / 110 /130 HI-FORCE WING TOP AIR INTAKE SET OF TWO. High quality components for your Defender Evolve & Enhance your Defender with the latest family styling. LAND ROVER DEFENDER 90 & 110 FRONT GRILLE UPGRADE KIT STANDARD. The KBX Defender Front Grille & Lamp Surround Upgrade Kit is easy to fit using existing fittings – no drilling or special tools required, just a straight forward swap for the existing components. RANGE ROVER SPORT 2005 - 2009 4.2 V8 PETROL. Land Rover or other logos and trademarks used on this site is for reference only. FOR RANGE ROVER 2006 - 2009 4.2 V8 PETROL. PART # 1347543. we also speak the following languages.